Mythology/history – Tsavorite is a type of Grossularite Garnet. It got its name due to first being found in the Tsavo National Park in Africe. 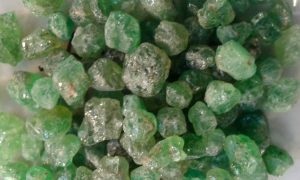 It has recently come into popularity as a replacement stone for Emerald. Healing – Helps with to strengthen the immune system especially when you are recovering, assists with allergies both pollen and animal, aides blood sugar issues, assists with inflammation and increases the libido. Wearing Tsavorite is a great way to open your heart and give you the strength to venture out in life and try new things and meet new people. Can be used in all meditations particularly when wanting to increase your psychic powers and intuition or contacting higher vibrational beings. Can be carried around in your stone bag in order to benefit from its vibration continuously.